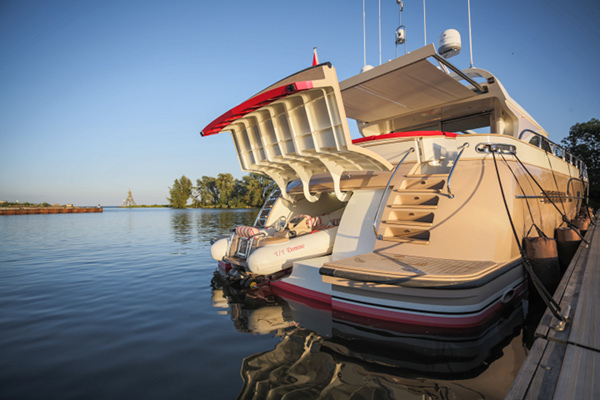 With an aluminium hull and superstructure and an interior consisting of light materials, the new Mulder Convertible 72 has the lowest possible weight. Installed in a very well-organised engine room with a superior finish, her two Caterpillar C18 engines of 1,018 hp each ensure a maximum speed of 26 knots. The insulated exhausts are finished in high-gloss stainless steel to enhance the luxurious appearance. Moreover, the yacht has a round-bilged hull with spray rails to guarantee optimal comfort in all conditions, even on rough seas. This is also achieved by stabilisers, which ensure a pleasant and stable performance. The hull is certified by Germanischer Lloyds. 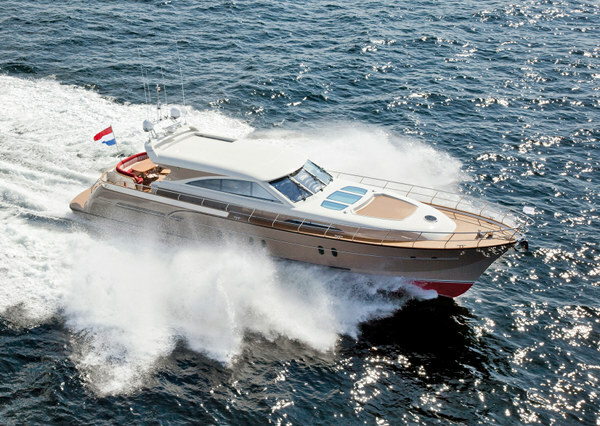 The new Convertible is a unique yacht with an intelligent layout, an interior and exterior designed by Guido de Groot, and naval architecture by Vripack. Designed in close collaboration with the owner, the spacious interior is finished in oak and high-gloss Makassar with various modern details. The robust leather sofas provide excellent comfort levels and a very pleasant atmosphere. The owner’s cabin and crew accommodation are located aft, and there is a guest cabin fore. All facilities are equipped with their own shower and toilet. 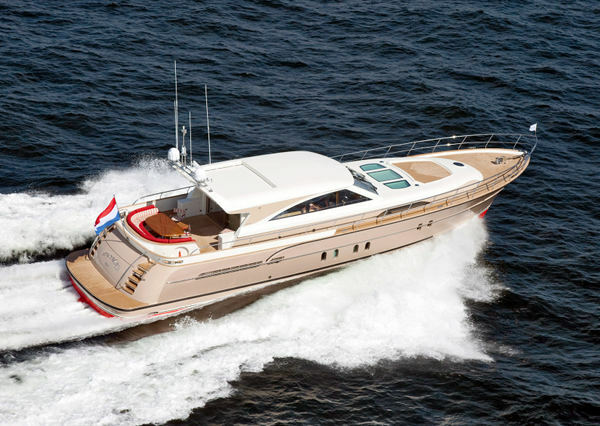 The exterior consists of a bicoloured hull with a finish that is continued in the superstructure. The decks are equipped with Estec and various stainless steel accessories, while the aft ship includes a garage for a 3.5-metre tender with jet propulsion and a hydraulic door. 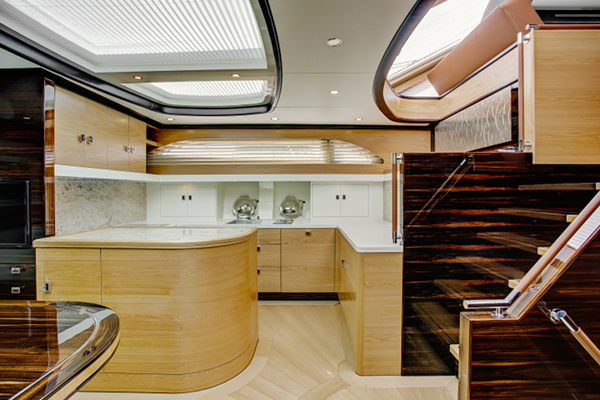 The wheelhouse has a large sliding roof which can be opened hydraulically, and a large skylight with automatic blinds in the forward part of the superstructure provides lots of light in the saloon. An application specially developed for the Mulder 72 Convertible allows all blinds, lighting and the audio/video system to be controlled via iPad. 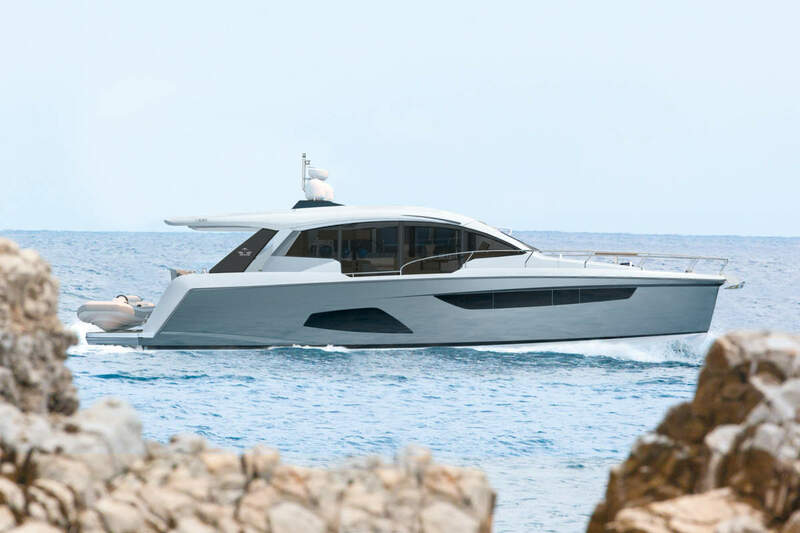 With her elegant lines, the new Mulder 72 is a beautiful yacht that serves as a distinguished addition to the renowned Mulder Convertible range.